The first official event of the North American International Auto Show in Detroit, The Gallery is a special invitation-only event that showcases some of the best high-end luxury and performance cars. Unlike a typical car show, attendees are allowed full access to these automobiles, getting the chance to sit behind the wheel of a Ferrari, McLaren, Aston Martin and more. Aston Martin V12 Vantage S: Aston Martin stuffed a 565-hp 5.9-liter V-12 into its smallest car to create the Aston Martin V12 Vantage S. The automaker claims the V12 Vantage S is the second fastest car in its history behind the seven-figure One-77 supercar. Large carbon ceramic brakes stop the car with authority, though the automated single-clutch transmission offers questionable performance. Aston Martin Vanquish Volante: With a 5.9-liter V-12 producing 565 hp, the Vanquish Volante offers an irresistible combination of looks and performance. Its long list of performance goodies includes Brembo Carbon Ceramic Matrix brakes and a Positive Torque Control system. Bentley Continental GTC: This convertible Bentley is large, luxurious and puts down some impressive stats. For starters, its 6.0-liter twin-turbo W-12 engine makes 616 hp and Bentley says the Continental GTC will run from 0-60 mph in about four seconds, despite its curb weight of well over 5000 pounds. Bentley Flying Spur: A 5644-pound sedan that does 0 to 60 mph in 4.3 seconds? Say hello to the 616-hp Bentley Flying Spur. Under the long hood sits a twin-turbo 6.0-liter W-12 mated to an eight-speed automatic transmission that routes power to all four wheels. Bentley Mulsanne: The Mulsanne is one of the most expensive and special luxury cars available on the market. Even more astonishing is its ability to accelerate from 0-60 mph in under five seconds, despite its curb weight that approaches 6000 pounds. Falcon F7: Built in Detroit, the mid-engine rear-drive Falcon F7 is powered by a modified 620-hp 7.0-liter LS7 V-8 from the last generation Chevrolet Corvette Z06. With a body and monocoque chassis constructed of aluminum, carbon fiber, and Kevlar, the Falcon F7 weighs a mere 2850 pounds giving it a power-to-weight ratio of just under 4.6 pounds per horsepower. Ferrari F12 Berlinetta: At a tick over two tons (4003 pounds), the Ferrari F12 Berlinetta is no lightweight, but it makes up for it with a 731-hp 6.3-liter V-12 mated to a seven-speed dual-clutch transmission. In our testing, the F12 Berlinetta reached 60 mph in 3.6 seconds. Ferrari 458 Spider: Widely called one of the best-driving cars ever produced, the Ferrari 458 Spider features a mid-mounted 4.5-liter V-8 producing an impressive 557 hp. And thanks to its low-slung body, the 458 Spider will easily turn heads on the street. Jaguar XFR: Sporting a 510-hp supercharged 5.0-liter V-8 and eight-speed automatic transmission, the Jaguar XFR sedan is one ferocious kitty. While the standard XFR is limited to 155 mph, an optional Speed Pack (suspension and aerodynamic enhancements) raises the limiter to 174 mph. Fast cat indeed. Lamborghini Aventador Roadster: Boasting a 6.5-liter V-12 making close to 700 hp, the Aventador Roadster is one special and fast supercar. Its body consists of composite materials and a seven-speed dual-clutch gearbox ensures quick and smooth shifts. Lamborghini Gallardo: The Gallardo has been a very successful car for Lamborghini thanks to its menacing and attractive body and powerful V-10 engine. Look for its successor, the Huracan, to arrive sometime in 2014. Lingenfelter Corvette: The tuners over at Lingenfelter are not shy when it comes to modifying vehicles, new and old. That said, the Lingenfelter Corvette they’ve created combines a powerful and impressive powertrain and a classic ‘Vette bodystyle. Maserati Ghibli: The Ghibli is the newest addition to the Maserati family. With a number of engine choices and four-door practicality, the Ghibli fits in nicely between the two-door GranTurismo and the Quattroporte flagship sedan. Maserati GranTurismo: This Italian coupe gets its sweet-sounding V-8 from Ferrari. Not only is the GranTurismo fast, but it’s also a suitable grand tourer, perfect for road trips . McLaren 12C Spider: The McLaren 12C Spider is the open-roof version of the 12C coupe, allowing the driver to work on his tan and track skills. Perhaps more impressive than its butterfly-style doors is its 3.8-liter twin-turbo V-8, which produces an astonishing 616 hp. Porsche 911: The Porsche 911 is one of the most iconic sports cars on the road today, which hasn’t strayed from its rear-engine formula since its introduction decades ago. The current iteration includes a number of variants like the Targa roof body style. Porsche Cayman S: With its mid-mounted flat-six engine, the Cayman S offers a rewarding driving experience. Its combination of balance, power, and handling is difficult to match. Rolls-Royce Wraith: The Wraith is a new model from Rolls-Royce with many distinctive features including its suicide-style doors. The Wraith also showcases top-notch craftsmanship with premium leather and high-quality accents. SRT Viper TA: This special Viper is built specifically to conquer the track. In addition to its 640-hp 8.4-liter V-10 engine, the Viper TA sports high-performance wheels and suspension bits. America’s Motor City is getting ready to host the North American International Auto Show, or you might know it better as the Detroit Auto Show. It will be Detroit’s first major event since the city filed for bankruptcy, the largest municipal bankruptcy in U.S. history. We are here at The Gallery, the event, which officially kicks off two weeks of the 2014 North American International Auto Show here in Detroit. And this is a sort of an appetizer – a display of the world’s most elite vehicles: 28 of them in total. And it’s really la cre de la cre of luxury and performance car-makers – Maserati, Bentley, Ferrari, Aston Martin, Lamborghini, Porsche, Jaguar and Rolls Royce. These are very special cars with very special price tags – from $100,00 to $400,000. One car that especially drew our attention is this one – Falcon F7, it’s a sports car that’s produced here in the Detroit metro area.The entire shell or body of the car is made of carbon fiber, which is a material that is a lot lighter than steel. It’s what’s called an exotic boutique car – and so far only 8 of these cars have been made and sold in the world. So there you go – a very special car. Yours for just $225,000. The auto show itself will be huge. This year will see 500 vehicles on display and more than 50 new model and concept introductions. Around 5,000 journalists from around the globe will be here covering the event. And some 800,000 people are expected to attend the public show. And all of this is, of course, going to be extremely beneficial for Detroit’s economy. One of the biggest introductions is going to be from Ford. It’s expected to unveil its latest 2015 model of its F-150 pickup truck – which has, of course, been the best selling car in this country over the past 30 years. DETROIT, MI- “The Gallery” continues to evolve as the North American International Auto Show’s premier event for ultra-luxury car buyers. The private event — attended by about 400 or so people Saturday night — featured nearly 30 vehicles valued at more than $7 million, according to officials. For the first time in its seven-year history, the Gallery also featured a fashion show from Detroit’s Styleline Magazine with fashions provided by Neiman Marcus. “It was high energy,” said Bob Caza, producer of the event and executive director 9 Communications. Caza said the average price point of the vehicles is between $100,000-$200,000. The most expensive vehicle on display was the Lamborghini Aventador with a price tag just under $400,000. Vehicles brands at the event included Aston Martin, Bentley, Falcon Motorsports, Ferrari, Jaguar, Lamborghini, Lingenfelter, Maserati, McLaren, Porsche, Range Rover, Rolls-Royce and SRT. A handful of the 13 brands in attendance, Caza said, either sold vehicles or have sales pending. “There was a lot of cars moving last night, which is always good” he told MLive during a media preview of the vehicles Sunday morning. One of the most popular vehicles at The Gallery, according to officials, was the Michigan-made Falcon F7, a carbon fiber body super car featuring a 427 cubic inch LS-7 engine with Lingenfelter high performance components. 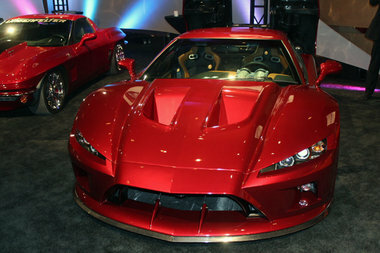 The F7 has a price tag of $229,000. The event was presented by Dan Gilbert’s Opportunity Detroit. Limited presale tickets were available for $500 each, but most attendees were exclusively invited. The NAIAS is considered one of the top global automotive events in the world and of huge importance to Metro Detroit. Since its introduction 25 years ago, officials estimate the show has had a $9.7 billion economic impact on the region. This year is expected to have a $365 million impact. The Detroit auto show will be open to the public from Jan. 18-26 at Cobo Center, One Washington Blvd., following Press Preview Jan. 13-14; Industry Preview Jan. 15-16; and the Charity Preview featuring musician Sheryl Crow on Jan. 17. Automakers are expected to unveil more than 50 vehicles during the two-day Press Preview to start the 2014 NAIAS.